Located in the heart of the Phong Nha-Ke Bang National Park, the cave, which is more than 200 metres in width, 150 metres in height and approximately 6.8 kilometres in length, was explored by the British Cave Research Association during 2009-2010 and it has been open to the public since 2013. It is believed to have been formed 2-5 million years ago. Son Doong Cave has been recognised as the largest of its kind in the world by three international record-keeping organisations – Guinness, the Association World, and WorldKings. 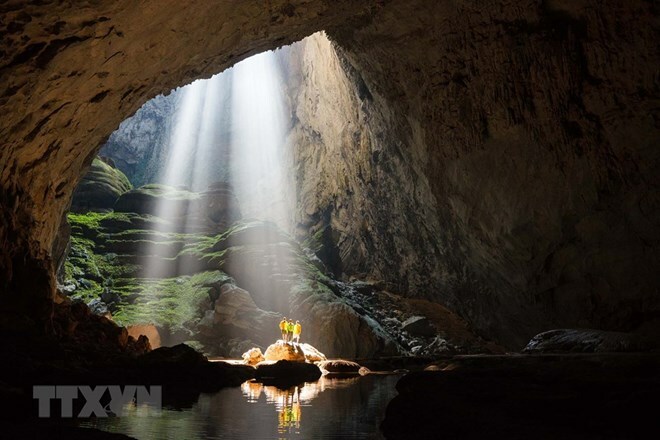 The cave attracted 243 tourist arrivals from 34 countries and territories across the world who joined 32 pilot tours “Conquering Son Doong-the world’s largest cave” operated by the Phong Nha-Ke Bang National Park management board and Oxalis Adventure Tours in 2013. It generated over 15 billion VND (645,600 USD) for local tourism in the eight-month trial period. The tours created stable jobs for 40 locals, with average income of 6 million VND (258 USD) per month at that time. Taking the cue from the adventure tours, local tourism services have been developed as well. Besides, the Son Doong tours have helped popularise the UNESCO-certified Phong Nha-Ke Bang National Park as well as the province’s tourism to the world. Holding important scientific values, in terms of geology, geomorphology and ancient climate, the cave has been favoured by many scientists and science channels worldwide.